Just once did Romo find himself able to sign with whichever team he wanted. That was in 2003, when he first joined the Cowboys as an undrafted free agent and made $225,000 in salary during his rookie year. With Romo nearing free agency again, things have changed just a smidge. Sixteen years after he signed that first contract with the Cowboys, Romo is one of the most sought-after faces in sports media. His ability to diagnose plays has caused him to go viral again and again, and his infectious enthusiasm for the game is a breath of fresh air. He even managed to stay entertaining in the slog that was Super Bowl LIII. CBS has unquestionably found a winner in the former Cowboys quarterback. And it might lose him after three seasons. Romo’s contract with CBS is up after next season, and every single NFL rights holder could have interest in him. In a market with players like that, you can imagine Romo is going to see a raise that takes him well above his current $4 million salary. 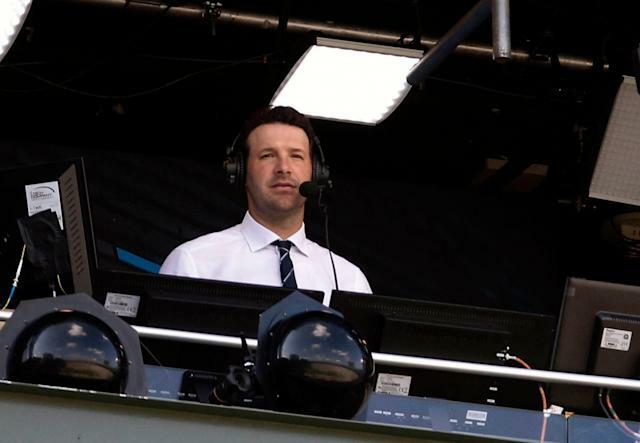 Michael McCarthy of Sporting News reports that Romo’s camp is currently seeking an extension with CBS that makes him the first announcer in history to make more than $10 million per year, surpassing John Madden’s peak of $8 million per year. That would be a massive investment for just one game a week, but Romo gives CBS something that no other network has. Joe Buck and Troy Aikman are roundly criticized at Fox. ESPN’s “Monday Night Football” has been a disaster since the departure of Jon Gruden, and even then Gruden was treated with more mockery than reverence. NBC’s “Sunday Night Football” crew of Al Michaels and Cris Collinsworth have been solid, but their biggest viral fame in recent years might be a chair slide. In Romo, CBS has a crossover star that can make a 1 p.m. game must-see TV for some fans and is more famous than all but a handful of active players. Andrew Marchand of the New York Post reports that CBS can match any offer Romo receives in free agency and would like to extend him, though that could require quite a bit of money. Bryan Curtis of The Ringer has heard that Romo could make even more money if he’s free in 2022, when the major networks’ NFL rights packages expire. Darren Rovell of the Action Network quotes an expert that believes Romo could reach Madden’s value “not now, but maybe in the future,” and it is very much worth noting that Madden’s $8 million salary would be $14 million in today’s dollars when adjusting for inflation. Richard Deitsch of The Athletic tweeted that Romo’s relationships at CBS, particularly with Jim Nantz, are strong enough that he doesn’t think Romo will leave, but there are plenty of reasons to think Romo’s salary is about to skyrocket. Especially if ESPN misses again on Peyton Manning and wants to make a splash with “Monday Night Football,” which Marchand reports could allow Romo to start the bidding at $10 million. Of course, all of this is just the financial dynamics of Romo’s broadcasting career. The flip side is what so many speculated during the NFL playoffs last season: that Romo could use his predictive magic to make bank as an NFL coach. At least one team has reportedly checked in to see if Romo is interested. Romo has deflected speculation around that in the past, but he didn’t rule it out completely. Why would he? Gruden just received a 10-year deal that makes him one of the highest-paid coaches in football. Clearly, Romo’s future earning potential could be at an all-time high a decade after the prime of his playing career. Then again, what matters most could simply be what Romo wants to do with his life. He should have no shortage of takers.